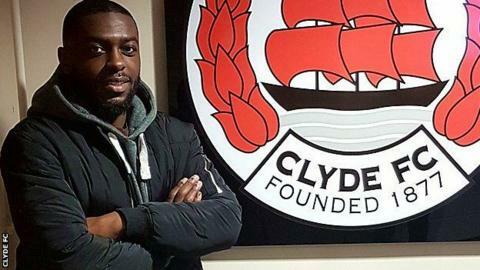 Steve Kipre, brother of Motherwell defender Cedric, has become Clyde's latest signing as manager Danny Lennon rebuilds his squad at Broadwood. The 25-year-old striker left French fourth-tier outfit Uzes Pont du Gard in 2015 but had impressed on trial. Lennon told Clyde's website: "He's great in the air, he's strong and he can hold the game up with his strength. "He's a threat on the counter-attack and he'll complement what we already have." Kipre, who has signed on amateur terms until the summer, was on the youth books at Paris St-Germain before spells with Moulins-Yzeure Foot 03 in his French homeland and Köllerbach in Germany. Younger brother Cedric, 21, has made 34 appearances since signing for Scottish Premiership outfit Motherwell after leaving Leicester City last summer. Kipre is the second player from a well-known football family to join Clyde within three days. Ray Grant, a 21-year-old midfielder, is the son of former Celtic and Scotland midfielder Peter Grant and brother of Falkirk defender Peter and joined the Cumbernauld club after being released by Norwich City last summer. Former St Mirren and Alloa Athletic manager Lennon, who took charge in November, had a difficult start to his tenure with seven games without a win. However, he has since led his eighth-placed side to three straight wins, including defeats of League Two leaders Montrose and second-top Peterhead, to move 13 points clear of bottom side Cowdenbeath. Among his six signings during January were midfielder Jack Boyle and defender Dylan Cogill on loan from English Premier League club Huddersfield Town's development squad.